Ode to the Tomato | Jake & Sam -- Let's Cook! As soon as the tomato season gets into full swing in Provence around the beginning of July, we jump up early on Sunday mornings and head to the nearby village market. First things first: Our Sunday ritual of coffee and croissants on the terrace has to wait until our return. There are many vegetable stalls at the market but for those in the know there is one that hands down wins the tomato gold medal, and you need to get there early to make sure you’re in the running. We often buy 3 or 4 kilos (6-8 pounds) to take care of our tomato addiction – we certainly wouldn’t want to run out during the week. Aside from gazpacho and simple salads, there are a zillion other ways we use them: In sauces and vegetable tians, in tarts and omelettes, stuffed and sundried, to name just a few. Except for maybe the onion is there any vegetable more useful than the tomato? Here are a few of our favorite quick-and-easy recipes which I hope will add to your repertoire for those occasions when your palate (or your family) demands a change. I actually made up this recipe about fifty years ago. It was so well received that I’ve continued to make it every summer and then hand out the recipe to friends who ask for it once they’re tasted it. It does require tomatoes at the peak of perfection so don’t even think about making it with inferior ones. 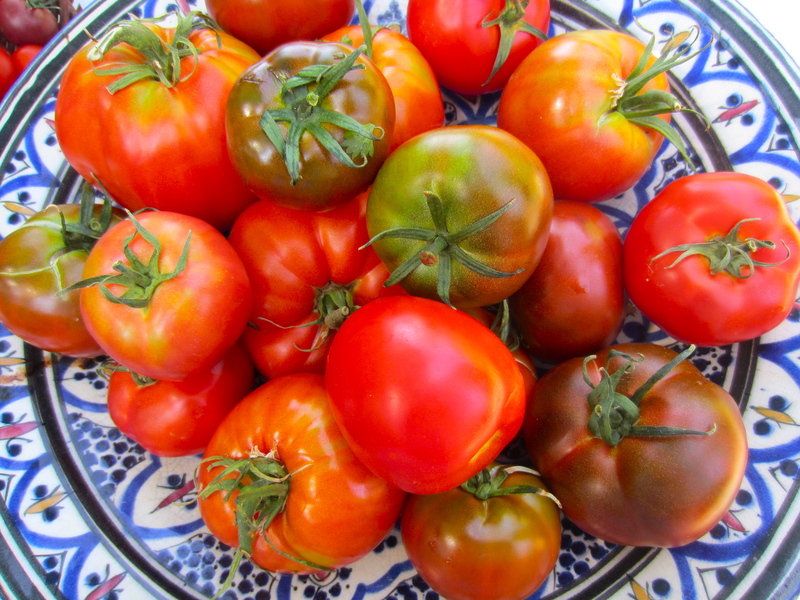 Plunge the tomatoes into boiling water for a minute, drain, rinse in cold water and peel. Chop them up roughly and puree them in the food processor, leaving a bit of texture. Add the rest of the ingredients and pulse a few times to combine, then add salt and pepper to taste. Chill well and serve. This is a wonderfully rich soup. Don’t leave out the ham – surprisingly, most people think it tastes like crab. Well, add me to the list of disapprovers. 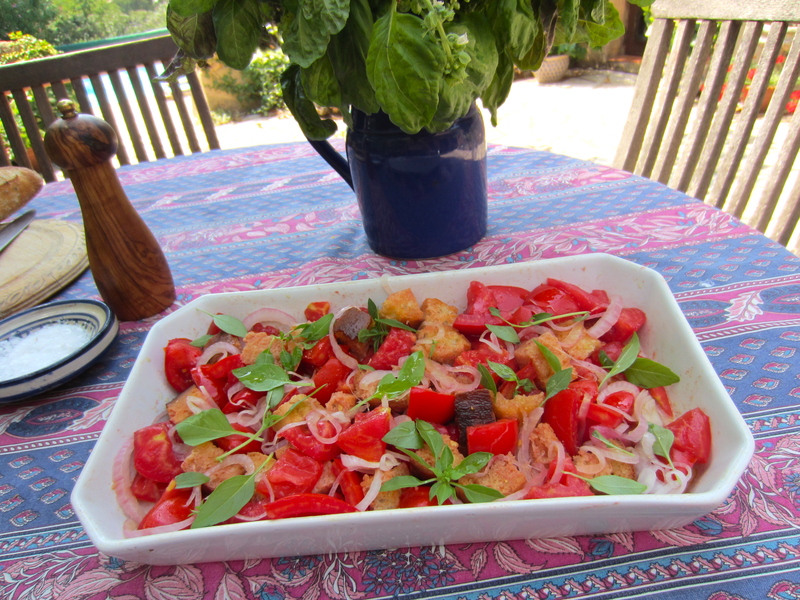 First of all, it should be made of top flight ingredients – ripe, summer-sweet tomatoes, stale crusty bread (Tuscan unsalted if you happen to live in Tuscany), mild red onion, your very best olive oil and vinegar, salt and pepper and a sprinkling of fresh basil. That’s it. Well, some chopped cucumber and a little garlic won’t hurt but any of the other ingredients listed above are strictly taboo, at least in our household. We also don’t like to soak the bread in water as it makes it mushy. Better to add it directly to the bowl with the other ingredients, toss it around and it will absorb the tomato juices, oil, and vinegar while retaining some of its chewiness. Put all the ingredients in a large bowl and mix thoroughly until the tomatoes release some of their juices and the bread is no longer dry but still crisp around the edges. Let sit for 10 minutes and toss again before serving. Additional suggestions: If your bread isn’t completely dry, put the cubes in a low oven (150 degrees) for about 10 minutes. You can use a Vidalia or other sweet onion or, if your red onion seems sharp, put the slices in a small bowl and just cover it with a mixture of boiling water, 1/2 teaspoon salt and 1 teaspoon vinegar and let soak for 10 minutes or so. Drain well. This is a good way to tone down raw onions for any recipe. These are two summer pasta dishes where all you have to cook is the pasta. We love the contrast between the hot pasta and the cold sauce and even if the pasta cools a bit, they are still a summer delight – easy and quick to make with ingredients you probably have on hand. Both recipes are for four but you can obviously increase or decrease quantities easily, depending on whether you’re serving it as a first or main course. Although we prefer lighter pastas such as angel hair or spaghettini for both, you can use whatever pasta you have on hand. 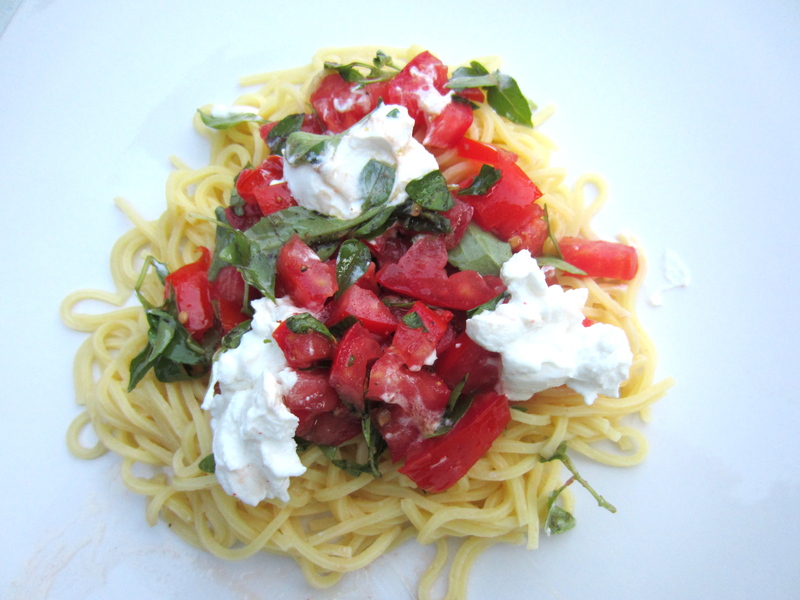 Put the tomatoes and basil in a bowl to which you can add the cooked pasta. Make a vinaigrette: Pound the garlic clove with a teaspoon of salt in a pestle and mortar (or bowl if you don’t have one). Add the vinegar, olive oil and pepper and stir to combine. Pour over the tomatoes and mix thoroughly. 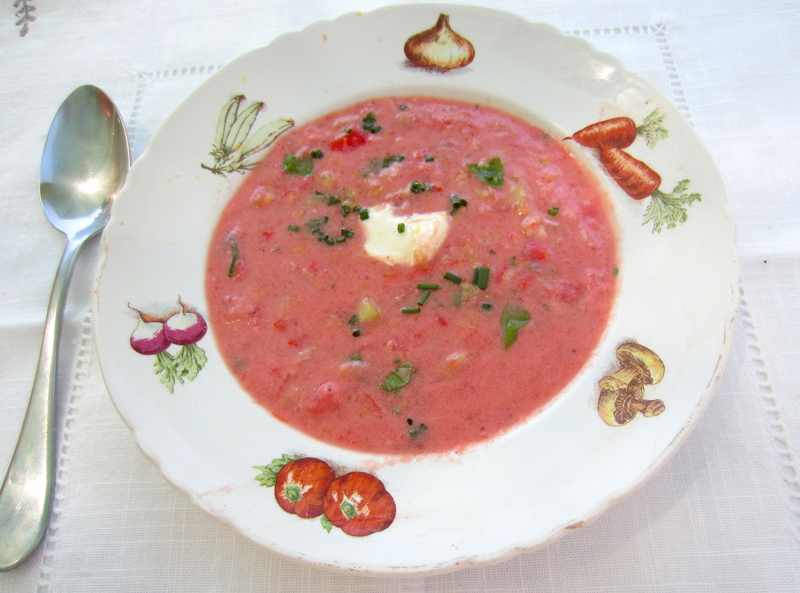 Soften the goat cheese by whipping it with a fork so that it will melt into the sauce. If it still seems stiff, add a teaspoon of cream or milk. Cook the pasta in salted water according to the package directions, drain well and stir it into the tomatoes. Serve immediately with a dollop or two of chevre crowning each serving. If you don’t happen to have chevre on hand, this dish is still wonderfully simple and satisfying without it. You’ve probably seen recipes for spaghetti alla puttanesca or “whore’s spaghetti.” There is always a lengthy discussion on the origins of the dish and why and when the whores of Naples made it. It actually dates from the mid-20th century, but who cares? Enough to say that they got it right – it’s a lusty, warming dish for a cold winter night. But the ingredients are so invitingly earthy that I thought why not put them together without cooking them so that the dish could be enjoyed when tomatoes are at their peak? Needless to say, I was not the first person to have this insight. 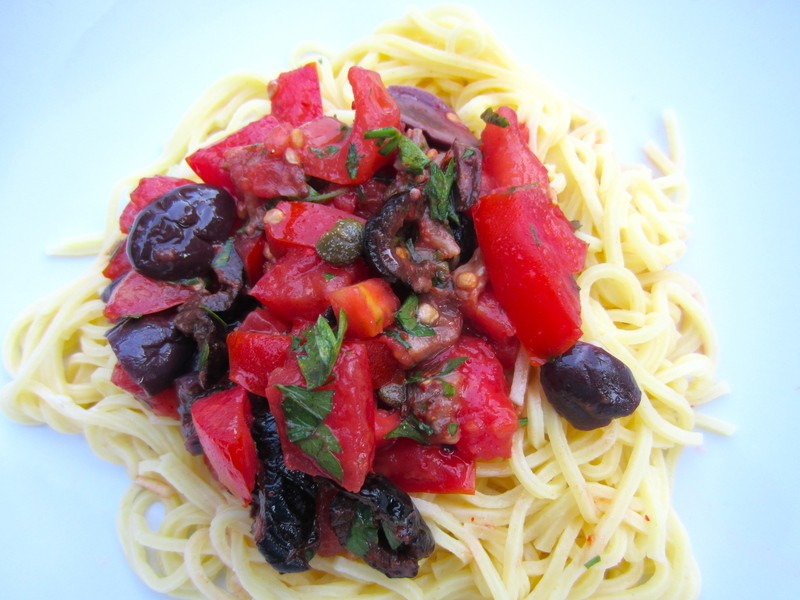 Mix all the ingredients in a bowl large enough to accommodate them and the pasta. Cook the pasta in salted water according to the package directions. Drain well and add to the bowl, tossing to coat with the sauce. Check for salt – you won’t need pepper. Serve immediately. Thank you for these wonderful recipes! You taught me the tomato soup one many years ago, and it is still a favorite — no one can guess what is in it that makes it taste so good. I look forward to trying out the other dishes, especially fresh puttanesca.